Right from the VERY first line, I gasped, shocked at what I just read, and I was hooked. And to be honest, it doesn’t surprise me that it came from Colleen Hoover, as she’s written “love stories” in so many genres (some sweet, some forbidden, some with incredible personal growth, even that dark one… “Too Late”) that it just makes so much sense that she’d venture into a creepy, psych-thriller obsessive-love territory, too. Maryse: I finished Verity and yeah… whoa. That was one of the craziest, most disturbing read at times (such incredible selfishness), but I loved it, because I had NO clue what was going on and what was happening… and the ending left me… strangely satisfied. LOL!!!! HOLY. MOLY. Amy: Verity is screwing with my head. I’m with Jenn…how is this a CH book? She must have been spending time with Tarryn Fisher lately. *snicker* …Okay, this book is creeping me out. Verity isn’t scary, it’s more like WTH is going on?? Michele G: I started Verity Friday morning and finished it on Saturday…it was a crazy good trip!! I stand by my statement that I think Colleen Hoover and Tarryn Fisher are playing a prank on us…I keep waiting for her to say…JK it was really Tarryn who wrote the book…but seriously, it shows her wide range….it was twisty good!! Amy: So, I finished Verity and…damn. *shakes head* That was crazy. If you’re a CH fan, give it a shot. Just don’t expect it to be one of her romances! …Yep, Verity definitely had traces of TF (Tarryn Fisher) vibes in it. Jenn: OMG guys I started Verity Friday night and woke up Saturday morning and could not stop reading it till I finished. HOW IS THAT BOOK A COHO BOOK, I can’t even tell ya I literally still have no words and still can not pick up another book and because of this I went on a baking spree this weekend…….my husband thought I lost my mind and I guess I sort of did in that book! …I must say didn’t see that end coming and I felt like I was punched in the gut, slapped upside the head…rolled over and kicked. 🙂 I loved every second of it and two days later still can’t pick up another book…well I can but it’s useless. Lisa: I read Verity over the weekend too and thought it was phenomenal. It’s been a while since reading a story left me feeling that anxious and unsettled. I didn’t see that end coming at all. I never even suspected something like that. It’s so hard to find something else to read when you’ve been wowed by a book, but I think it’ll have to be something with kittens and rainbows and unicorns farting glitter!!! Erin: I just finished Verity and I am supposed to be working. I… I.. yeah I need more time to think about this one. I had to close my phone last night at a certain point as I was reading and move it away from me. Michele G: I’m having a lot of fun seeing the reactions people are having while reading Verity! It’s almost as much fun as reading the book myself for the first time! Just had to share that somewhere that people could actually appreciate it…carry on. Amy: I agree about Verity…seeing people’s reactions on here as they read it is going to be fun. Cheryl: Curious but a little afraid of Verity. 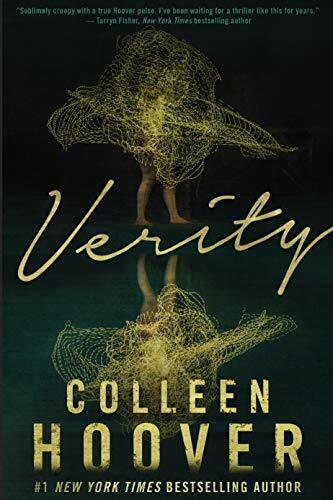 Linda: Verity was my first Colleen Hoover read. Just wow. Michelle S: Verity was good, but that ending… Wow. Just wow. Not only sharing names, but so much more. JR: I just finished Verity. It was such a departure for Colleen and for me. It took me longer to read it because I couldn’t read it before bed with its creepy vibe lol! Shara: I just finished verity by colleen Hoover. I love her books and I loved this one. I could not put it down. So good! Go in blind. I’m going to stop right here for a second, and insist you heed Shara’s advice and go in blind!!! IF you can handle books that are dark, with scenes that are absolutely disturbing… thoughts that will shock you. Yes. There were times that the intense love (and hate) felt by one of the main characters was so ugly… so sadistic and scary-sociopathic and just completely evil, that I was repeatedly yanked right out of my comfort zone, appalled, my jaw on the floor. I couldn’t believe what I was reading, the reasoning that I was privy to. But this stuff and these thoughts happen, which makes it even scarier. I believed it. We hear about it all too often on the news. People so obsessed with what they want that they’re willing to do AWFUL things out of selfish, psychopathic needs. And this story explored those very dark rationalizations. Thoughts and scenes that lead us through the mind of a monster. Someone by all outward appearances, seems… perfect. Famous author, Verity Crawford, has had a bad accident and is unable to complete a HUGELY popular series she’s contracted for. Lowen (our heroine), during a time of financial struggle, is offered a ton of money to “ghost write” the remaining 3 books in the series. Surprised that she’s the one they want, she apprehensively accepts the job, and stays in Verity’s home with her husband and child, hoping to learn more about Verity’s thought process and writing style. Go through her notes to match the feel of the “series” and writing style as a whole, and bring it to its conclusion. Somewhat dismayed when she discovers that the whole series takes place via the villain’s POV (those are quite some shoes to fill). But the shock of all shocks is when she discovers an autobiography Verity was writing, hidden deep, out of reach. Out of reach, that is, except when you’re going through every nook and cranny of her office hoping to learn all that is “Verity”. I LOVE ugly love stories. This is one. Was I creeped out and cringing? YES. But who am I kidding? I relish exploring lives through the eyes of the villain and/or the victim. What made this one so captivating was that I was never really sure WHO was the true bad guy. Or I should say… I suspected there was more to it, than the obvious “bad guy”. Subtle foreshadowing… had me raising my eyebrows a few times (both eyebrows, ’cause I can’t do that cool thing with just one) 😉 I had so many questions and suspicions. This story could twist and turn in any direction. AND THAT is what I love. It kept me guessing right to the very end, and WOWOWOW what an ending it was!!!! 5 stars <— OF COURSE!!!! This is the exact type of read I’m in the mood for. ALWAYS. This was the last book I read in 2018, and it hit the spot. What a way to end off a reading year! :D!!! Awesome review Maryse-I still think about this book especially that ending. I really need to read this book! I keep hearing such good things! I read this book after seeing it on several of your readers’ Best of 2018 lists. Verity is the best/worst book I ever loved/hated!! Omg! So out of my usual. This book captivated me in the worst way. Couldn’t stand to read it; couldn’t wait to get back to it. I WAS Lowen. Hard to describe. I’m anxiously looking for a very light hearted comedy romance to help me shake this feeling. Wow! Just wow. Verity was the best/worst book I’ve ever loved/hated! I would have to take a break after some chapters, but couldn’t wait to start reading again. I felt like I WAS Lowen. It affected my sleep, my mood. What a book! Now, I need a nice rom-com! Love your review! It was definitely my fave read of 2018! I read this yesterday, in an afternoon. It was crazy. Creepy. Unputdownable. Major love-hate relationship with this book. I have talked about it a lot, so that must mean something. Great review! Such a change for Colleen Hoover! I think she WAS temporarily possessed by Tarryn Fisher!!!! Great review! This is sitting on my kindle waiting on me. I screwed up and read the very end – afraid of what I was getting myself into and not realizing I was going to ruin the whole book for myself. Gah!!! Alison!!! I know how tempting it is (I used to do that all the time when I was a teenager) but I love the suspense so I don’t do it anymore. I can’t do that “thing” with one eyebrow either, but can I tell you that I LOVE it when the guys in books do that? Does that make me crazy? Other crazy details I like – when he tucked her hair behind her ear, when he puts one ankle on his knee, when he puts both elbows on his knees, when he turns a chair around & straddles it, of course the arms crossing as he leans on the wall, and the mother of all hotness is when he puts both hands on the top of a door frame! Fanning myself. In some books, the hero does them all. Macho overload! Ha! I’m an idiot. BTW – my hormonal rant was not about THIS book, just books in general, and what details I like in a guy! OMG MichelleS! I GET IT!! Yes to all that! Michelle, I get it too!!! All swoony. Just finished !! Im still trying to process it all ! Sick to my stomach at some points and still just don’t know what to believe ! Exactly, Britt!!! That’s still how I feel… I love that, though. FREAKED ME OUT!